COGNITIVE: Body encountering space leaves evidence, just as space is altered by the presence of body. The relation between the two elements, body and space, brings forward the spirit and psychology of a city through thought, experience, and the senses. PHYSICAL: Gjakova is a tangible synthesis of build and natural environments. The architecture gathers meaning by its everyday function, by its presence in the townscape and by its form, while the natural assets (water, topography and greenery) present the critical agents for city’s performance and sustainability. 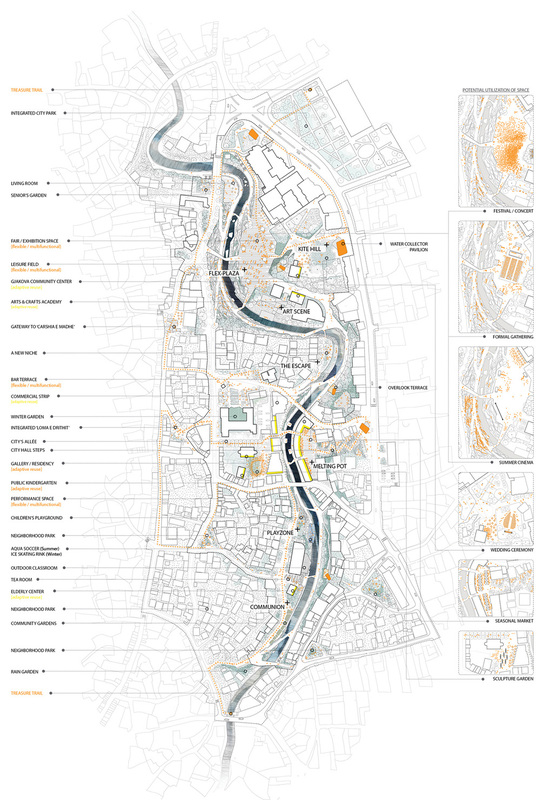 “Gjakova’s synthesis of build and natural environments is achieved through making diverse spatial experiences along a linear continuous path that meanders gently along the river. Complementary are the structural components that cross the river and architectural public features. GREEN HINGE: The site of intervention is a hinge between major parks of the city such as Cabrati Hill, Shkugeza Park, City Park, and other public parks. 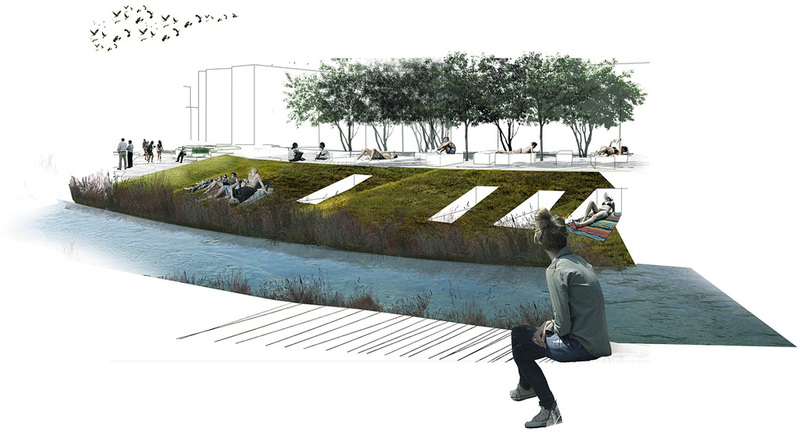 The role of the river is transformed into a unifying element within the landscapes of the city with a great potential to also be woven into people’s lives. 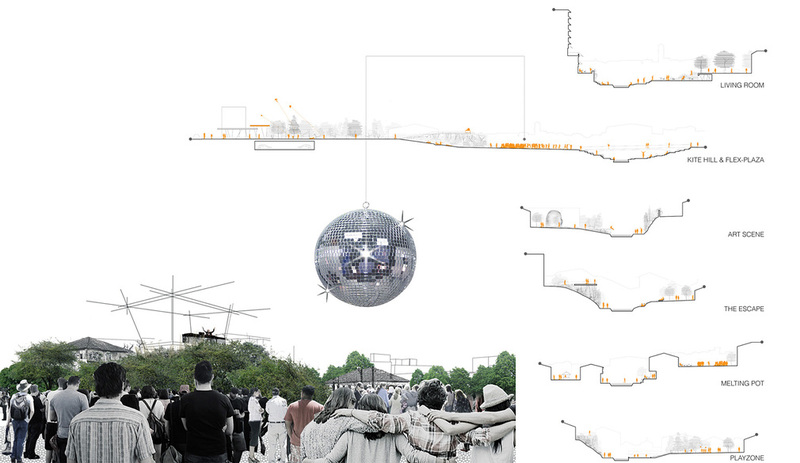 CONSTELLATIONS’ NUCLEUS: Existing diversity of functional typologies merges at the city center and forms the basis for city’s self-sustainable industry, economy, and tourism. 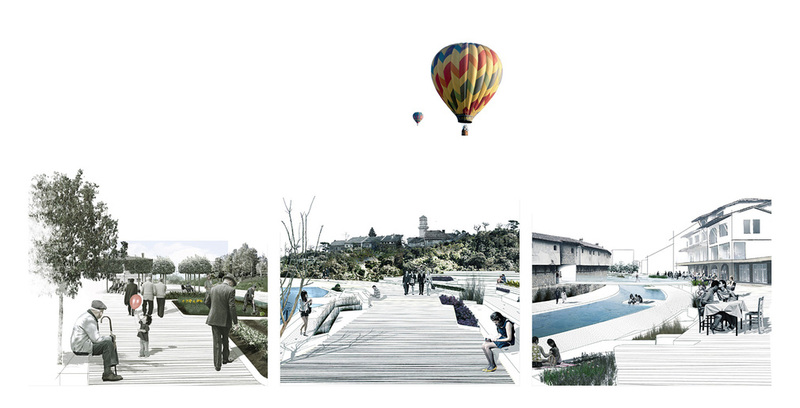 Integration of the river, and spaces along it, as part of the city’s nucleus presents a passageway that encourages consolidated and interdependent functional constellations. Gjakova’s center provides complementary functions by reactivating neglected buildings/spaces into uses that promote youth engagement and a new re-attachment with the city. FLOW: The existing infrastructure presents opportunities to adapt the road network into a more pedestrian and bike friendly city center. The web of major routes approaching the city are harmonized by a reoriented inner loop which eases congestion and allows for a regulated flow of movement in and out of the city. Connectedness and accessibility are necessary conditions for a healthy economy, culture, and community. “URBAN SURGERY: Disassembly of existing structures consists of mostly (90%) informal and temporary commercial-use structures. In response, a cautious incision of new urban infill is proposed to complement the scale of the context and accommodate the displaced functions. Urban voids are occupied by new structures to create a fulfilling street experience. SHARING IS CARING: Bicycle lanes, bike-sharing system, single-directional traffic, adequate parking areas, pedestrian-only zones, flush curbs, and wheelchair mobility make the city center more flexible, easily accessible, and welcoming. Multiple modes of movement coexist in shared areas and the river becomes an integral component for an improved experience of city’s interior. LEARNING LANDSCAPES: The gems of the city are interconnected in a 1.6 km long trail marked with an uninterrupted cobblestone course. Furthermore, the Treasure Trailbecomes a learning experience for and about the city of Gjakova, which also leads towards a new economic and touristic growth. All images courtesy of Erblin Bucaliu, Rrita Pula, Dea Luma.